This April newsletter is jam packed with updates on Ward Priorities in South Winnipeg–St. Norbert! March was so busy I didn’t have time to compile a newsletter, so this edition makes for a good ‘long-weekend read’. Bev and I are also preparing a special PARKS UPDATE that will be issued by mid-May as there are many park upgrades scheduled this season! I’d like to express my sincere gratitude to Bev, our Ward Operations Manager. With 66,700+ residents in our Ward, there's an incredible volume of work, phone calls and e-mails that flows through our office, combined with all the community initiatives I am working on. Somehow, Bev keeps manages to keep everything on track. Much gratitude to Bev for all the support she provides to the South Winnipeg–St. Norbert Ward! Happy Easter, Happy Sri Lankan New Year, Happy Vaisakhi, Happy Passover, Happy Happy we live in Canada! Enjoy the April long week-end! • A new Fire By-Law with ‘teeth’ is expected to pass at our monthly City Council meeting on April 26. This by-law introduces many new ‘fees’ that can be applied when an illegal rooming house is identified. These fees are IN ADDITION to the $800/room fine applied for not having a smoke detector. • Winnipeg's Public Service staff are reviewing how other cities in Canada deal with rooming houses around universities and study regulatory licensing requirements. This is not a unique problem to our community, but rather a problem across North America. There are many solutions and best practices that can be investigated and potentially implemented in Winnipeg. Results of the study will come forward in fall, 2017 with recommendations on how to proceed. THANK YOU to all residents who are REPORTING infractions and to the many media outlets that have been shining a light on this life/safety issue. I cannot stress how important it is to report suspected rooming houses and by-law infractions! For details on how to PROPERLY report, see: Reporting By-Law Infractions. When reporting, your personal information is protected as required by the Provincial Protection of Privacy Act. The City has added three additional Fire Inspectors and a By-Law Officer to investigate and crack down on landlords who are not complying with regulations. The list of room rentals on two popular rental websites (http://www.kijiji.ca/ and http://mapliv.com/ ) is very extensive. City staff and I are very aware illegal rooming houses are an issue in other communities in our Ward, so I encourage everyone to report. Please feel free to share this with your neighbours as well as friends across the City! Starting September 3, transit buses will be servicing the communities of Bridgwater Lakes and South Pointe! Routes and details are on my website at Transit Routes Finalized. • I have also posted a brief overview on how transit is funded almost equally by the Province and the City. Overall, I believe Winnipeg and the Province should be investing more in Transit, thereby reducing the number of vehicles on our roads and the cost of road maintenance. • The Federal Government has another round of Federal Transit Infrastructure Funding that will be made available to the City in the near future, so I look forward to potential expansion of the City’s transit network. I’ll be the first to say the City is providing a Transit service that can be greatly improved on – and am working to see that happen. I’m involved in the planning of some upcoming public information sessions on how other cities have successfully re-modeled their transit network. Please watch my website for details! The “Be Aware. Park with Care” education campaign recently launched by the City reminds drivers to follow laws when stopping or parking around three specific areas: schools, fire lanes and designated parking spaces. Effective May 1, 2017, Winnipeg Parking Authority will be using cameras to identify violations and mail tickets vs issuing paper tickets placed on vehicles. Parking violations around schools are a huge problem causing traffic delays and creating hazardous conditions. I have received hundreds of requests from parents, teachers, principals and school bus drivers, all asking for increased enforcement. For many years prior to being elected, I worked on improving safety around schools. Quite honestly, I was shocked at the high number of traffic violations and am pleased to see this new level of enforcement. The City officially starts its spring clean-up on Tuesday, April 18. The $6M clean up involves removing sand and debris from over 7,000 lane km of streets,1,600 lane km of walkways and over 50 bridges and medians. As well, crews will be cleaning up litter and debris in City parks. In total, 300 pieces of equipment and 500 workers will be focused on cleaning the City. A HUGE THANK YOU to the many community groups in South Winnipeg-St. Norbert which are coordinating clean-ups of their neighbourhoods! Pitch in and come out on a Saturday, or take a spring walk and pick up some garbage to help keep our community clean! See SPRING CLEAN! This issue might be the most ‘dull of dull’ to some, but truth be known, it has absolutely THE most impact on how we operate our City and spend YOUR taxpayer dollars. I am supporting a call for a Civic Governance Review to look at and REFINE how the Mayor and City Councillors make decisions. Virtually, every large corporation reviews its governance model every 5-10 years, if not annually. Winnipeg City Council has not initiated a review for almost 20 years! Hard to believe, but no Mayor has wanted to look at emerging best practices and improve how we make decisions within our governance model for nearly two decades! I have absolutely no doubt this is the foundation for why such poor decisions have been made in the past and will continue to be made in future. And virtually all decisions involve tax payer dollars! Again, this is not the most engaging topic, but it is at the core of how YOUR City Hall conducts business. I want a review to be initiated before the next City election in 2018, so real change can occur sooner vs later. The Mayor and his Executive Policy Committee have postponed the call to do a Governance Review this year, and have not allocated funding. The Mayor asked that funding be considered in the 2018 budget process, but that is no guarantee or reflection on strong leadership looking to improve on how we conduct ourselves, make decisions and do business at City Hall. If you’ve made it this far in my newsletter, BRAVO and I encourage you keep reading and review Civic Governance Review. Please look closely at the final graphic depicting how delaying a governance review can impact the timeline for real change in this Mayor and Council’s term. I will be working on this file and shedding more light on the significance of completing a review until an actual review occurs. In my opinion, it is astounding, in light of decisions made in the past and the ‘cry for positive change’, that leadership does not want a timely review on the core of how we operate at City Hall. I do! I welcome your feedback on any topic - please E-Mail jlukes@winnipeg.ca. 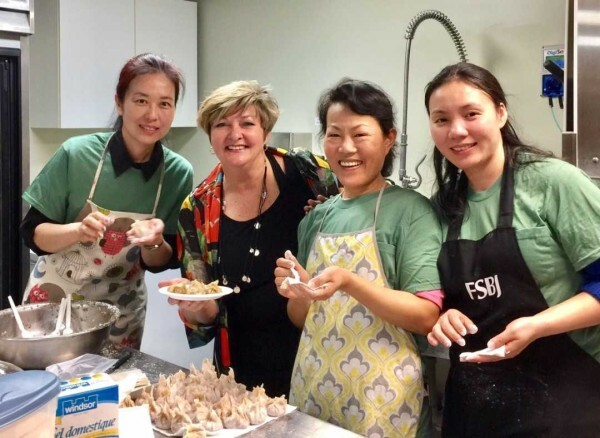 Celebrating Spring at Manitoba Chinese Family Centre in Fort Richmond with many hands making hundreds of delectable, tasty dumplings! *At some point in time, we have worked together on a project or communicated on a Ward issue. If you do not wish to receive my E-Newsletter, just click "unsubscribe" below. Thank you for your time.